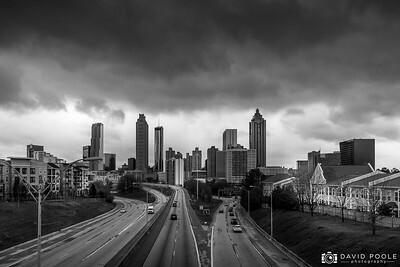 The Jackson Street Bridge is one of the best places to get a good view of the Atlanta skyline and is famous for being an establishing shot for The Walking Dead television series. During sunrise and sunset, there's often a line of photographers camping out to get a good shot along the side of the road here. This was a shot that I knew I wanted to take while I was in Atlanta, but I wasn't sure if I was going to have a chance to get it. I was only in the city for a few days and the weather wasn't cooperating. It was rainy and overcast for my entire trip but I made an effort to stop here despite the poor forecast. Fortunately, I think the atmosphere worked nicely for this photo. I was able to get this shot and a couple of others right as it began to rain. 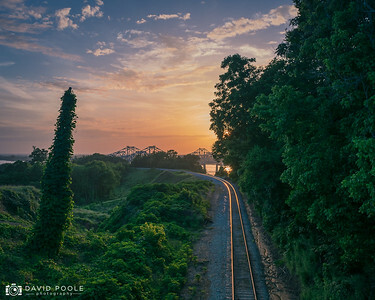 There are few places to watch a sunset that are better than the Bluffs in Natchez, MS. 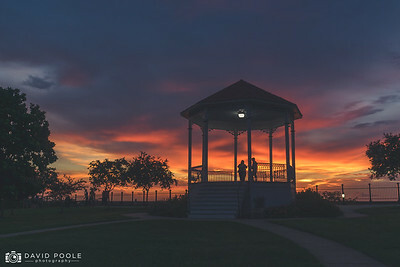 This gazebo on the Natchez Bluff is a popular spot for tourists and locals alike to get a spectacular view. However, many people forget that the gazebo is beautiful as well. I've driven past this view for years and this was an image that I've wanted to capture for a long time. My goal was to time this shot so the tracks could reflect the light of the setting sun and not be hidden in the shadow of the surrounding tree line. I've always thought this scene looked like it belonged in a storybook. I think kudzu always lends a bit of magic to a shot and the golden tracks look like they could lead to anywhere. This is a candid street photo from a trip to Atlanta, GA. 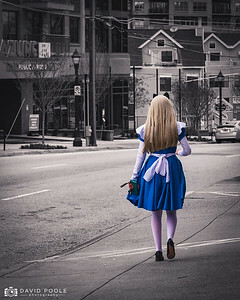 I was waiting for someone outside of a restaurant in Midtown when a young woman walked by dressed as the title character from Alice in Wonderland. I don't know who she was or where she was going, but I had time to turn on the camera and take a single shot as she passed by. She seemed really out of place, not unlike Alice in the story, and it's always been one of my favorite photos. There are many times that nature has left me awestruck. This was definitely one of those times. 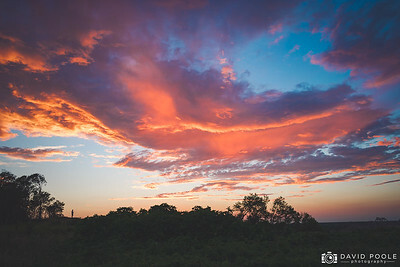 I have an affinity for clouds, especially when colors show up right after sunset, and this was one of the most impressive displays I've ever seen. The man in the bottom left corner of the photo was talking on his phone for a very long time. I hope he was able to appreciate the sky that night. 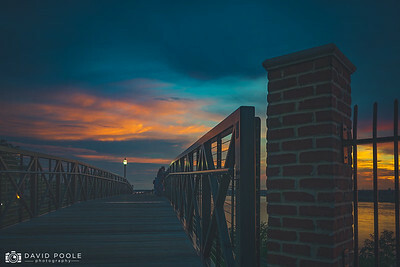 This bridge is named after a famous bridge in Venice, but it is a replica of one that existed in Natchez, MS from the 1830s until the early 1900s. There are a few different reasons why I take a photo, but in this case I was only trying to capture a mood. I hope that I succeeded. Christ Church in Church Hill, MS was built in 1858 and crafted in a gothic revival style inspired by churches in England. This building is the 3rd reiteration located on this hill with the original dating back to 1820. It is a beautiful church and something that I had wanted to photograph for a while. It took a few tries to get this photo because of inclement weather. Storms interrupted my first two trips to Church Hill and caused an early end to my third. This was the last shot I was able to take before the rain started. 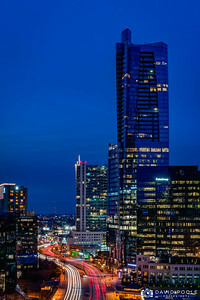 This shot was taken from a high rise apartment in the Buckhead section of Atlanta. Buckhead is a neighborhood in northern Atlanta known primarily for upscale shopping and nightlife and is often referred to as the Beverly Hills of the South. When I saw the view from this apartment, I knew I had to take a photo from here. The skies were overcast so there wasn't a visible sunset. However, I was very happy with this photo taken just afterwards during blue hour. In Mississippi, the seasons don't always make sense and flowers often bloom and fall before Spring has officially started. In February the azaleas start to bloom and transform the town into an anthophile's paradise. 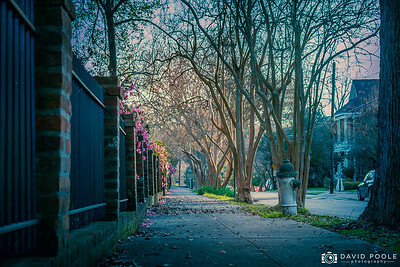 This street in downtown Natchez is stunning when the azaleas are in bloom. I've taken countless photos along this path, but the lighting in this one makes it my favorite. It makes the sidewalk feel like a passageway to another world. This is my favorite perspective of the Natchez-Vidalia bridge. 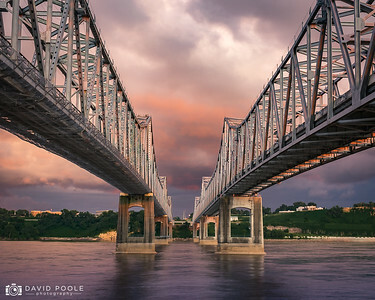 This passageway over the Mississippi River is composed of twin cantilever bridges with the eastbound bridge being 40 years newer and slightly wider. Because of this, it's impossible to have a perfectly symmetrical shot from underneath. That will never stop me from trying though. This photo was taken in the summer of 2017- a few days before the west bound bridge was closed for two years worth of maintenance. This was my only chance to get his photo before the work began so I braved the storms and I'm glad that I did. This was taken around dusk and the light from the setting sun gave the rain clouds a red hue. The Biloxi Lighthouse is the oldest standing lighthouse in Mississippi. I've always loved photos of lighthouses but, since I don't live on the coast, it's rare for to get an opportunity to photograph one. 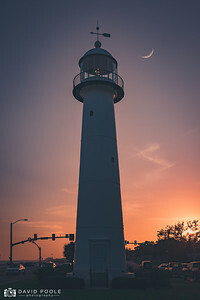 I made a point to get a few shots of the Biloxi Lighthouse while I was visiting the Mississippi Gulf Coast during Memorial Day weekend. 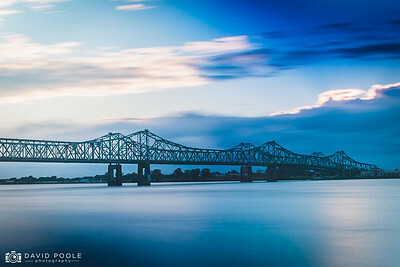 The Natchez-Vidalia Bridge is the most heavily photographed location in the area. I generally don't shy away from popular shots because most of the time I believe they're taken because they're simply great views. However, I realize that you can only take the same photo so many times. On a windy Sunday afternoon, I brought out a variable ND filter to see would happen. I was able to capture this long exposure shot and take a photo of the river that's a little different than the rest. My original intention when taking this photo was to capture the kudzu filled valley below the Visitors Center in Natchez, MS. 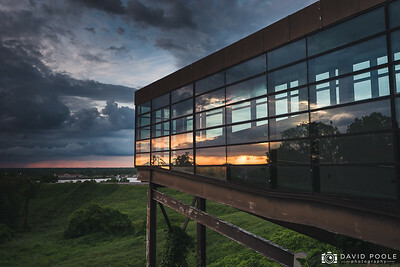 However, when I looked into my viewfinder I caught the reflection of the sun setting over the Mississippi River bridge in the building's glass, This photo is a favorite of mine because it is a reminder that sometimes the best shots are the ones that we didn't intend to take. This photo of Vidalia, LA was taken from atop the Natchez Bluffs. 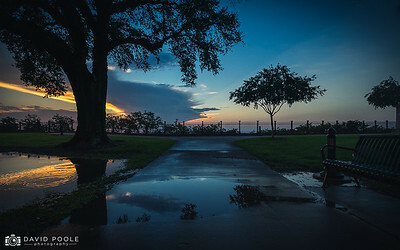 A storm was approaching during sunset and I was able to get this shot before the rain arrived. I've taken many photos of incoming storms, but I believe this one was my first. 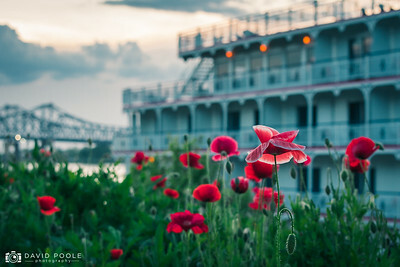 There are multiple riverboats that travel the Mississippi River and dock regularly at Natchez Under the Hill. It's always a good photo opportunity when one of those boats are in town. I'm also grateful that someone had the foresight to plant these picturesque wildflowers along the riverfront. On this day, I went Under the Hill to take a few photos and this particular flower caught my attention. It was imperfect, but it stood out as unique and it was beautiful. 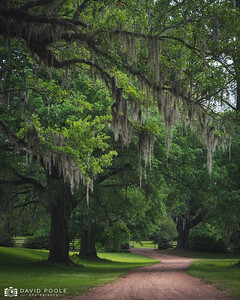 Spanish moss is often found growing on live oak and cypress trees in the southern United States. It's a beautiful sight that always reminds me of home. This particular photo was taken during a trip to Historic Jefferson College in Washington, MS. Jefferson College was chartered in 1802 and closed it's doors in 1964. It is now a registered historical site and has been used as a shooting location for multiple films. The secret to landscape photography is patience. Sometimes it seems impossible to get the perfect combination of weather and setting. 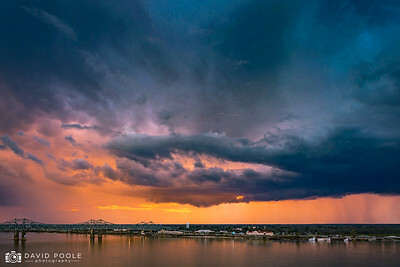 This day was rainy, humid, and dark.. and despite this I was dying to get a beautiful sunset shot on the Natchez Bluffs. I took a few snaps and although there wasn't a spectacular sunset that night I ended up with this. I like this photo because it reminds me that sometimes you can end up with an interesting image on even the worst days. Christ Church in Church Hill, MS was built in 1858 and crafted in a gothic revival style inspired by churches in England. This building is the 3rd reiteration located on this hill with the original dating back to 1820. It is a beautiful church and something that I had wanted to photograph for a while. It took a few tries to get this photo because of inclement weather. 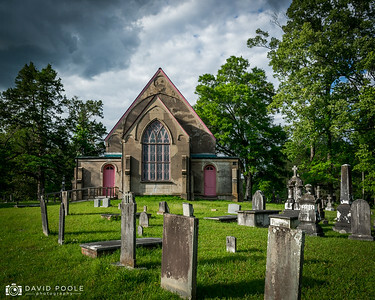 Storms interrupted my first two trips to Church Hill and caused an early end to my third. This was the last shot I was able to take before the rain started.